Racial Bias in Science Grants? 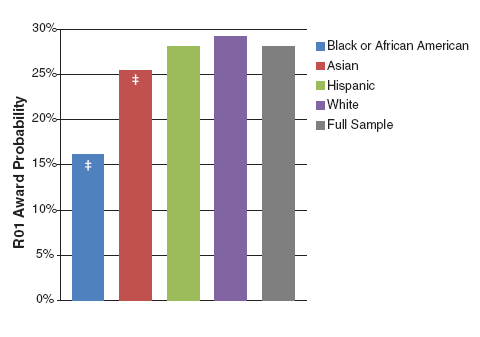 A study of grant scoring at NIH has found “racial bias” in grant awards. This is being discussed in a wide variety of places, all of which I recommend reading. I could say a great many things regarding this finding. It is a bit surprising, yet not really, and means absolutely nothing. It doesn’t change my previous NIH results, and it won’t change the next one. I am lucky enough that my research isn’t so expensive that I couldn’t do anything without funding (though it helps) and that I don’t work in a medical school where one might need 8 RO1s to even sniff tenure. So as a black academic scientist my reaction here is to think more about alternatives. NSF, DoD, private foundations, etc. I can’t guarantee that none of those places have biases too, but I am now more certain that NIH does. That might seem counterproductive for fixing this apparent problem, but it is a waste of my time and effort if the already small success rate is going to be even lower for me. The math doesn’t quite work out, but it almost seems that what I’ve heard is true. You do have to be twice as good. Hang in there Bashir and don’t give up so quickly. Odds are, this discrimination goes beyond the NIH…so where to run to? Some black PIs are getting their grants despite the reduced chances….make one of those you. Also, I suspect the next couple of years are going to be a very fine time to be an African-American applicant to the NIH….. The NIH has one tool for immediate change (pickups) and one tool for medium-range change (targeted FOAs). *IF* they are serious about making change this is the obvious step…fund some black PIs. I’m betting they won’t be able to resist using these levers to make it look like they are DoingSomething. Bikemonkey- biases usually does go beyond what one particular study finds. Still, with NSF’s broader impacts approach, maybe they at least try a little harder sometimes? I’m really curious what the data from NSF looks like. Thank you for the post. You are lucky you can apply for a grant. I’m been paying my taxes for the last 10 years without being represented and I don’t see any chances for me to be a PI, black or white. Cheers! Also, congratulations on this interesting blog Dr. Bashir. I’ve subscribed to it and I’m looking forward to other interesting posts.